On Sunday, my hubby took the kiddos to the zoo so that I could have some time to write. Ah. 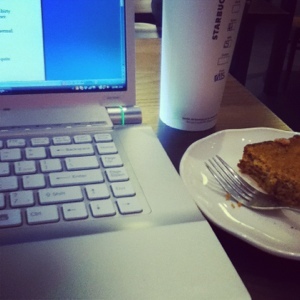 So, I packed up the old, faithful laptop and headed out to Starbucks. Soy misto (aka cafe au laut) and a piece of pumpkin bread next to the computer, my fingers pecking away at the letters, I felt quite fine indeed. I decided to share this picture. “Working on Sunday,” I captioned it. A good friend of mine responded with a Tweet (seriously, it catches me off guard when I get a Tweet-back. I often forget about Twitter altogether). She twittered…er…twatted…um…Twizzlered…well, you know…she did the Twitter thing. I had to think for a moment. Yes. Keeping a Sabbath day holy. No working on the Sabbath. Right? A day of the week to leave off of work and focus wholly on the Lord. Had I broken one of the commandments? I had to consider it. If I hadn’t gone to Starbucks and the kids hadn’t gone off to the zoo with Jeff…hmm…what would I have done at that moment. But, sitting at the brand new, shiny Starbucks, a huge cup of coffee in my hand, I sighed. Listened to a whole lot of nothing much (beside the Bob Marley CD they had playing over the speakers). The aroma of freshly ground dark roast wafting around me. A story taking shape on the screen before me. A story of mercy. I realized, yes, that moment was a Sabbath moment. A moment of rest. A moment to train my focus on the work that God has for me. That Sabbath moment was a gift. From my husband. The barista. The Father. It was made for me. Not I for it. I relished the moment and praised God for it. Then set my fingers to typing some more. Found rest in the writing. Just an FYI; I’ve got a creative and fun contest going over at my Jewelry Blog. Click HERE to enter…it’s pretty cool. I truly know what your speaking about. I find this in my tiny sewing room so often. With bits of fabric and threads stuck to me. I find a soothing moment when I allow myself time to get lost in the whir of my little machine. Thank you for giving it meaning. Isn’t it lovely when you find that thing that is purposeful and yet calming? Ah. And, Jessie, you are quite skilled in that sweet sewing room. I can’t wait to see your latest creation! Are you making fabulous items to wear at Breathe? Oh tee hee. I am focusing all my things on breathe. I made new pajama pants, a skirt, and am hoping to have a rain jacket to bring. So yea, it’s good for me to have time limits to get things done… Just don’t ask me how much writing I’ve accomplished for it! I’m reading this on a Sunday afternoon. Right in the middle of a debate with self about how to appropriately spend the rest of this lovely gift of a day. Thank you for sharing and helping me to decide. No more laundry, definitely not the cleaning or cooking that’s calling me now! Instead, I’m choosing to take a walk-n-talk with my Creator and then do something creative! Hugs! Oh, Denise! I hope you enjoy that time! So important!